Every 3 or 4 years, the TOGETHER Network organises an International Meeting of the Corresponsability Territories. Those meetings represent really important moments in the network's existence. The First International Meeting took place on the 25th of September 2009 in Mulhouse, with the support of the city and the European Council. This meeting was the first step of the informal TOGETHER network. Few months after, the network beneficiated from the Urbact program with 8 pilot cities in 8 different countries. 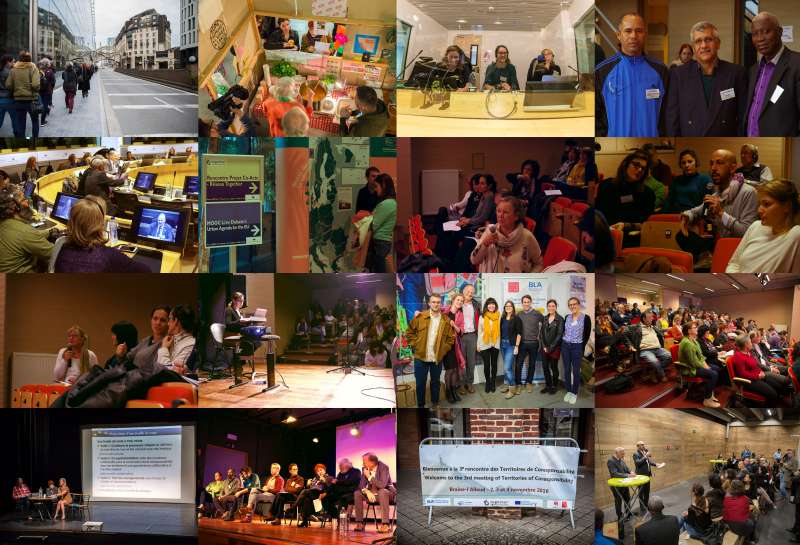 The Second International Meeting, which also took place in Mulhouse on the 22nd and the 23rd of November in 2012 was the end of the Urbact project. It led to an enlargement of the network to all territories developping SPIRAL, leading to the formal constitution of TOGETHER during the year 2013. The Third International Meeting will take place in Braine L'Alleud on the 2nd, 3rd and 4th of November 2016. It will mark a turning point for the CO-ACTE project. TOGETHER will indeed propose to politics a roadmap beforehand debated largely with citizens and civil society. We hope that it will be a political dialogue which will continue to be affirmed long time after the meeting. It will be the occasion for us to enlarge partnerships with other networks that share similar goals, notably the one part of the CO-ACTE project. Since 2012 each reunion is the occasion to establish an Extraordinary General Assembly taking in consideration new orientations in order to elect a new board of three cities / territories. Those cities will ensure coordination for the next years. The current 3 cities are Kavala (Grèce), Braine-l’Alleud (Belgique) et Kairouan (Tunisie). Promises of a new working group with economical actors to think together about how stepping out of the profit logic at short term to go toward fundamental values. A meeting which, one year after the COP 21 and its redefinition of the Millenium redefinition of objectives, will echoed by proposing their illustration and its concretion by corresponsability approaches in between local and global level. 9h00: Official opening of the meeting : Welcoming words from Mr. Olivier Parvais, Deputy Mayor, President of the Social Action Public Center and Provincial Advisor. Introduction of the day by Mr. Lassaad Ghedami, Mayor of Kairouan (Tunisia) and Mr. Dimosthenis Toulkidis, Deputy Mayor of Kavala (Greece), Board Member of the TOGETHER network. 9h30: Spiral method’s and TOGETHER network’s history by Ms Cécile Sornin, Adjunct of Participative Democracy representing the Mayor of Mulhouse, pioneer in that approach. 9h45: General presentation of the results of CO-ACTE : synthesis of the citizens’ expectations, contributions of the 4 thematic reunions and presentation of the road map proposal which ensued by Mr. Samuel THIRION, General Secretary of the TOGETHER network and presentation of the various participants working on the project – Debate with the public. 11h00: Round table on the political interest of the road-map from a local level to the European one with Mr. Olivier Parvais, Deputy Mayor, President of the Social Action Public Center and Provincial Advisor ; Mr. André Flahaut, Budget Minister of the Public Service and Administrative Simplification of the Walloon-Fédération ; Ms Gilda Farrell, ex Division of Research and Development for Social Cohesion chief at the Council of Europe ; Ms Sabine Storme, Ambassador of Cittaslow International. 16h00: Second part of the workshops. What are the potential partnerships between networks for the roadmap ? 19h30: Welcoming words from Mr. Vincent Scourneau, Deputy Mayor of Braine-l’Alleud and by Mr. Gilles Mathieu, Governor Of the Brabant Walloon Province. Intervention to present what the meeting and TOGETHER network want to propose to politics by Mr. Samuel Thirion, General Secretary of TOGETHER. 10h45: Debates and exchanges with participants about the propositions presented to finalize the roadmap which will be presented to governments and to the European Comission. 16h00-17h00: Workshops by countries : How can that road map be applied in the different countries? 17h45: Welcoming words of Ms. Marie-Anne Hatert-Marloye, Municipal Councillor charged of Culture and Informatique, and of Mr. Vincent Batens, Director of the School of Arts of Braine-l’Alleud. Drums of the Academy of music of Braine-l'Alleud : "Visite d'un monde sonore !" 18h30: Animation "Kitchen" : Transposable kitchen is a project of Thorsten Baensch and Christine Dupuis since 2000. It is an artistic act, participatory, already presented in Brussels, Düsseldorf, Courtrai, Kuala, Lumpur, Louvain-la-Neuve, Munich, New-York, Singapor and Tunis. Transportable because she drives, she writes her own story by showing the state of the links which unite us throughout social statuses, origins, encouraging to not avoid the idea of a common future in choice or restriction. Kitchen is place of theater, a place of cuisine and a place to share. Exchanges through years gathered a thousand recipes which allowed to publish 7 editions of artists' books. 10h45: What objectives and what strategy for the after Braine L'Alleud and the 3 upcoming year. Election of a new Board of Direction.